Why: Tree Lighting Ceremony .. Santa is Coming .. It's always great fun! We are pleased to be sponsoring our 12th Annual Hometown Christmas late night shopping event right here in Magrath. Please remember this event is held annually on the first Thu evening following US Thanksgiving .. 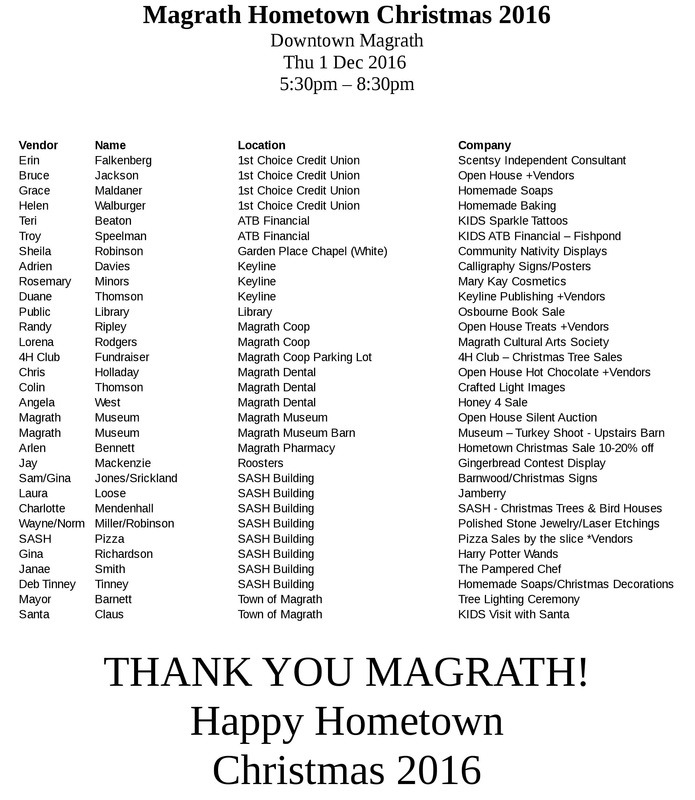 Thanks to the Town of Magrath, to Mayor Barnett and his administration and town council and all the town workers for providing the Santa Treat bags, for the lights on the trees, for the use of Town Hall and the Ice Arena tables. Thanks to Town of Magrath Fire Department for blocking off our downtown streets for the event, and to the Town of Magrath for use of their classic fire truck to bring in the Mayor and Santa for the Tree Lighting Ceremony (apparently there was not enough snow for Santa's sleigh this year). Thanks to the Chamber of Commerce for coordinating the event, for setting up the tables and putting them safely back home, for Chamber member sponsorships to pay for advertising and for providing a venue to hold the event. For the store owners and workers who missed all the fun staying open late. Thanks to Keyline Publishing for printing supplies for our tables and preparing the beautiful advertising cards and posters this year. Thanks to the Downtown Merchants who hosted tables for our 'Crafters Mall'; ATB, Roosters, Keyline Publishing, Magrath Coop, Magrath Dental, CJ Carwash, 1st Choice, SASH for hosting tables and especially to ATB and 1st Choice for hosting our Chamber of Commerce tables with CYB Nomination forms and Rooster Surveys, and to all the other Hometown Christmas 2012 Sponsors. Thanks to SASH staff and clients for helping prepare the treat bags and for hosting many Chamber meetings preparing for this event. Thanks to Mr Bill Simon for inviting Santa this year and to Roger Davies for assisting Santa as honorary Elf this year. Sorry the wait line was so long, but it was fun to see all the kids see Santa and get a treat. The line started at 6pm and finally ended after 9pm so Santa could head back home to prepare for Christmas Eve. Thanks to the Magrath Seniors for hosting their own crafters mall, to the Magrath Library for hosting the Nativity Displays and running their own fundraiser. Thanks to Roosters for hosting the Pals of the Pool in their kitchen - scones and hot dogs were a hit, and for hosting the Gingerbread House contest and silent auction. Thanks to Foothills Veterinary staff for bringing in their carriage and horses and drivers. Thanks to CJ Carwash for hosting the Depot this year for the carriage rides. Thanks to the Magrath Dental office for joining us this year and hosting the Fish Pond fund raiser. Thanks to the Magrath Museum for joining us for the fun this year. Thanks to Westwind News for advertising for us and covering the news event. Thanks to Soft Serve Direct for updating this webpage and documenting all your hard work. 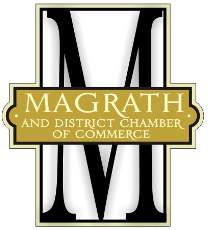 Thanks to Magrath Buy and Sell facebook page for letting us post updates from time to time. Thanks to all of you who came out to support us and contribute to this fun Town of Magrath tradition! And thanks again to all the Magrath and District Chamber of Commerce Society executive and directors and members who make this event happen. Did we forget anyone? Probably, but thanks to you all as well. We learned a lot this year and look forward to an even better event next year. Mark your calendars for next year!